When the opportunity to join the Love Notions Origami Tunic tour came up, I jumped at the chance. I made a lightweight cardi back in the spring, that I've enjoyed wearing all summer long when the AC was too cold at various places...but now that a hint of fall is in the air, I knew I wanted something a little more substantial. I am all about a pattern with options and the Origami does not disappoint! Three necklines, 3 sleeve lengths and hem options too...sign me up! I've been dreaming of a floral cardigan all summer long, but the more I've thought about it, knew that it wouldn't coordinate with many of my other wardrobe pieces...so I knew choosing a solid was a much wiser direction. The very week I signed up for this tour, the above pictured cardi was making the rounds in my facebook feed...every time I turned around, I saw this pic again, and it became embedded in my mind...and the more I looked at the Origami line drawings, I knew it would be a perfect jumping off point! To add a little extra versatility, I decided that instead of simply lining the front pieces of my Origami, I would go with removable/interchangeable front panels. For my trial run, I opted for a stretch lace I picked up on clearance at Wal-Mart awhile back for a whopping $0.50/yard...if I screwed it up, it wouldn't be too big a loss. I cut out my pieces, sewed on my snaps, and voila...a whole other cardi look came to life! Now time to cut my pretty plaid!! Perfect? No...but I am so tickled with how my knock-off cardi came together! All total I added 3 snaps on each side, though only time will tell if I need one or two more ;) I love that I now have a basic, wardrobe staple cardi that I can also quickly tweak to look like a much more custom piece! And if the mood strikes, it takes almost no time to add additional panels to the mix! My capsule friends will be so impressed!! And don't forget to enter to win!! 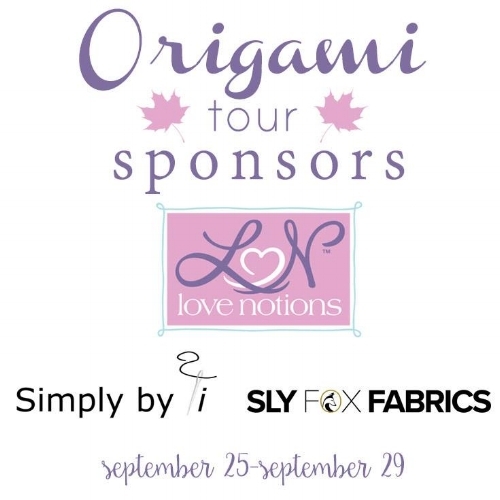 Up for grabs is $50 to Love Notions, $25 fabric from Simply by Ti Fabrics and a mystery box from Sly Fox...how fun is that!? !